Tagged under Yun Kouga, J.C. Staff, Light Novel, Series, Drama CD. New transfer student, twelve year old Aoyagi Ritsuka, has moved to a new school in hopes of escaping his trecherous past. Himself, never having a good relationship with a single being, has difficulty communicating with his peers until he is met up with a man who claims to be his deceased brothers friend or fighter. His name, Agastuma Soubi. Soubi, claiming to have known Aoyagi Seimei,and of had been his fighting machine,(in which seimei was his sacrifice), has come to tell Ritsuka that now he is his fighter. 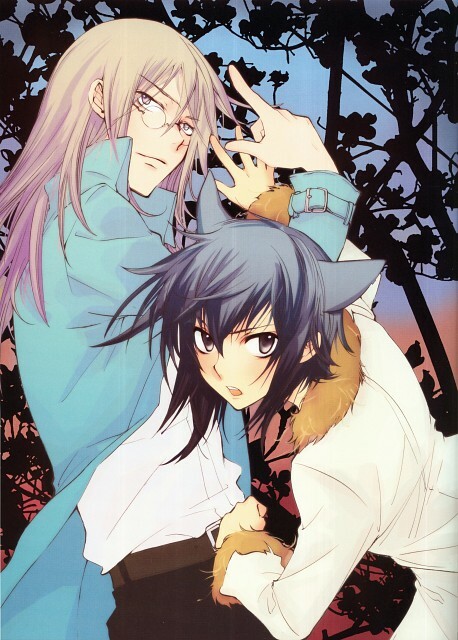 After being giving the knowledge that his brother did not die of mysterious circumstances, but killed by the organization named "The Seventh Moon", Ritsuka decides to join Soubi's side into investigating the entire truth behind his eldest brothers death. *sigh* The presentation of Loveless.....Is in riddles. Maybe it's about Ritsuka finding his "true self" lost 2 years ago after his brother's death . His brother himself is a riddle. Why did he die? Is he really dead? Why did Septimal Moon kill him? Who is Septimal Moon? These questions are asked by Ritsuka himself. Let's not forget Soubi's slick maneuvers to avoid Ritsuka's questions and his own dark past. I just don't know where to start in reviewing this story's depth. it's like you think, "AHA! THAT'S why!" but then you fully consider more than what you originally analyzed and go "Wait....". As said before, this anime is encoded in riddles that only your mind could think of answers to, but new get a straight response. Well, I think the story is pretty strange (at least not for all tastes), but still enjoyable. One of the things that bothered me, though, was the relationship between the two main protagonists... it's just weird .__. The characters are cute, especially with those nekomimi. J'ai horreur des series qui sont produites avant la fin de la publication originale et qui se terminent en queue de poisson. Cela peut être perçu comme une façon d'insiter les amateurs à se tourner vers la série manga, mais pour ma part, je trouve cela plus frustrant qu'autre chose. For those who read the manga the anime will propably disappoint since it shows almost nothing (I am refering to the plot...) but still it doesn't matter.. I have seen all the anime. the last episode is very good, different from the manga. Lots of love there. The manga is currently still a work in progress. I do wish there was more "love" involved in it.. Its more psychological and fantasy fighting then romance. One of the few shonen-ai I saw, I fairly liked it. The story is interesting and the way of fighting is unique, the romantic situations are not excessive, rather very sweet and well fitted in the rest of the story. The characters are nice and well matched. Unfortunately, the story remains poised because the manga is still ongoing. SOUBI AGATSUMA: "This skin is a nuisance. This skin that separates you and me...it's a nuisance"
Yun's cutest characters and a story full of emotions. I guarantee you'll smile and cry at the same time. This is the only good shonen-ai anime I have ever seen, I think. They just don't make them like this anymore - with a plot, no matter how little sense it makes. 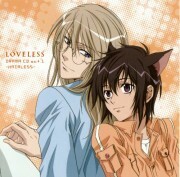 Loveless still remains one of my favorite anime, it's well made, interesting, beautiful and I didn't care about the rest back then. A contract between a Fighter and a Sacrifice is the main issue here and of course the feelings that are developed between both. This series was alright I guess. I only liked this series for 4 reasons. 2. The art and animation were amazing. ??? ????? ?????? ???????? ??? ???-??? ?..